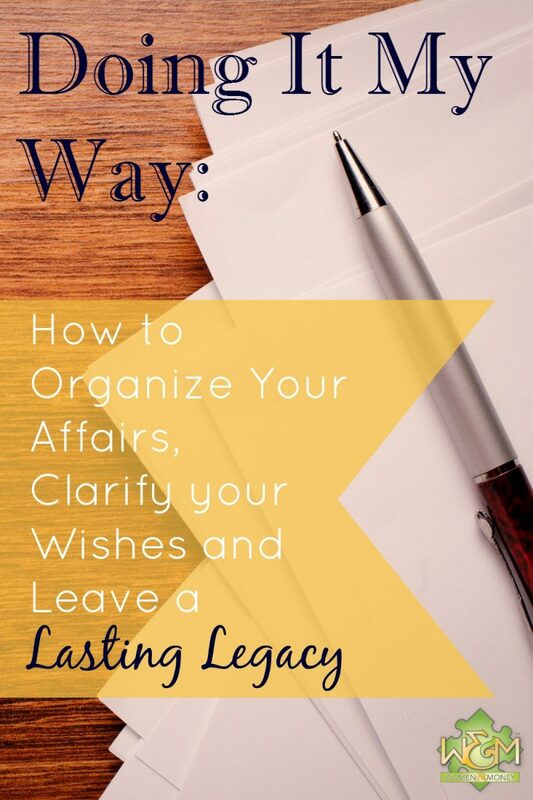 Doing It My Way - Women and Money Inc.
After that experience I realized I needed to organize my own affairs and clarify my wishes. And I wondered, how many others are in the same situation as me — not having a guide for their loved ones and worrying how they would sort it all out? If you’ve never had to deal with the affairs of a deceased person, you don’t know what you’re missing. Legalities, paperwork, notifications, account closures, financial changes and decisions decisions decisions. Let’s imagine the scenario that, God forbid, you pass away unexpectedly. Your family is distraught, but they need to act and make decisions almost immediately. They arrange for a memorial service at a funeral home, but not the one you wanted. They spend an exorbitant amount on a luxurious coffin that they feel you deserve. But you would prefer the money donated to charity and your ashes spread in the ocean. And they don’t notify or invite some of your dear old friends because they do not have their contact information. This is all within the first week. They are grieving and stressed, and there are months more of detective work, paper work and decisions ahead. Not a very pretty picture. Why not prevent this? Death is depressing, scary and downright uncomfortable to think about – especially our own death. If you talk about death, if you plan for after death, are you inviting death to your door? Are you making it more real, or even more likely to happen? Of course not. You know that death is inevitable, for all living things. You also know that death is unpredictable in time or circumstance. You know this, but you’re in denial that death could happen any time soon, and you focus your thoughts and energies on the comforts of life. But let me tell you, one of the greatest comforts of life is being prepared for death. It frees you to live your full life without the worry and fear of an unprepared departure. Preparing for the inevitable is a choice. It’s the choice of being rational and smart, as well as being proactive and considerate of your loved ones. Now let’s imagine this scenario: You complete a guide for your loved ones to follow. Your worry is gone, replaced with relief that you expressed your final wishes and organized your legacy. You’ve taken care of your loved ones to the best of your ability. With that weight lifted off of your shoulders you can embrace life the way you’ve always wanted to. When the time comes that you pass away, you have provided the answers to the questions. You have spared the stressful decisions and exhausting detective work for your family. Your family is grief stricken, but grateful, for your last gift to them. Knowing how difficult it would be for them, you were caring enough to act, to put in the time, to face your fears. It’s your last impression, and your last expression of love even when you’re not there. This is why I created Doing It My Way: Future & Estate Planning Workbook. Get your copy and simply fill in the blanks. Doing It My Way is a complete workbook to record your personal wishes and detailed information. It contains your personal financial information, contact information, personal assets, location of personal documents, memorial service details and personal last wishes. Use it to record information and wishes regarding your children, pets, assets and more. Help your family easily locate your insurance policies, loans, funds owed to you, credit card accounts, and important documents. Explain your medical history as it may benefit your children, grandchildren, and great grandchildren. Add as many details and personal preferences as you wish regarding your memorial, distribution of sentimental items and more. Doing It My Way does not replace a legal will, rather it works in conjunction with your Last Will and Testament. You are reading this because you know it’s the right thing to do. So stop procrastinating. Remove your worry and relieve your family with this final gift to them — you won’t regret it. You know you care, now it’s time to show it. Get the Doing It My Way workbook right now for a low introductory price (for a limited time).